Twelve-year-old Electra Firma plans to win an Olympic Gold medal in ice skating when she’s old enough to compete. Her coach is convinced she has the talent. That’s the problem. Electra’s talent comes from her part-alien heritage, which gives her superhuman abilities, and her parents forbid her from competing. Depressed, Electra rejects her inheritance and refuses to hone her alien skills. A new threat by an enemy alien race, forces her, her identical twin sister Isis, and their best friends to infiltrate the aliens to find the Flute of Enchantment and protect humanity. 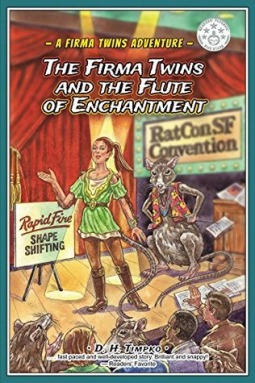 If Electra doesn’t master shape shifting, she and her best friend face imminent death. Other Editions: Ebook, $3.99 (ISBN 9780999459508) About the Author: D. H. Timpko is a long time reader of science fiction, fantasy, and mysteries. She and her husband, who she met at a science fiction convention, own over ten thousand books. They also own over a hundred paintings and prints. After working for many years as a writer and editor for publishing companies, associations, and corporations, Timpko retired. Now she writes fiction and nonfiction full time. She and her husband live in northern Virginia, along with their intellectually challenged, but sweet, cats Kalliope and Cocoa and their friendly pug, Bailey.